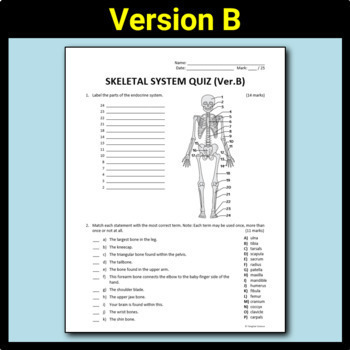 This Skeletal System Quiz comes in two versions to prevent cheating. Both versions contain the same questions but in mixed order. Alternate the versions used between neighboring students to prevent cheating. 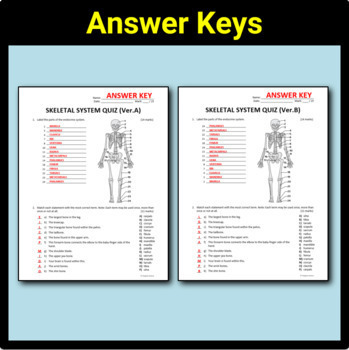 This quiz comes in editable Microsoft Word documents as well as PDFs with full answer keys. 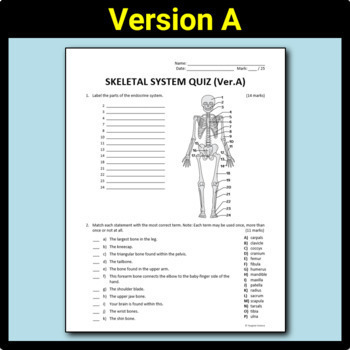 When you need a quick assessment of your students' understanding of the skeletal system that isn't a nightmare to mark, this 25 mark one page quiz will deliver. This will roughly take students 10-15 minutes to complete depending on their academic level. 14 Marks for labeling the parts of the skeletal system on a diagram. 11 Marks for matching questions. None of these questions have been taken from any pre-existing test bank or program. I have created each question myself. 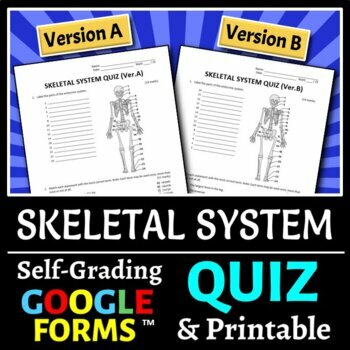 As well, I drew the skeletal system diagram used in this quiz (in Adobe Illustrator) to provide a clear and accurate illustration.